Superior Signals, Inc. of Olathe, Kansas has introduced a new safety back-up alarm line. 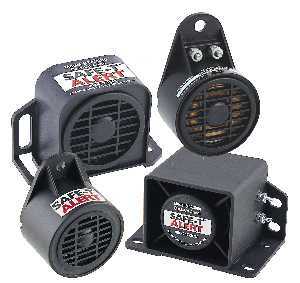 The Safe-T-Alert alarms are available in five models. Applications for this product line ranges from light industrial to heavy construction equipment. The various decibel ratings operate from 85 dB to 107 dB and they include both self and manual adjusting options. There is also a variety of mounting options. These alarms can be steam cleaned, and will operate in rugged environments. All the alarms will be UL Listed. The Safe-T-Alert alarms will be manufactured at Superior Signals, Inc. in Olathe, Kansas and will meet the high quality standards used by Superior Signals, Inc.
Superior Signals, Inc., 15785 S. Keeler Terrace, Olathe, KS 66062. Tel: 913-780-1440; Fax: 913-780-1427.